When you buy a new car, as part of the package comes what is called a Logbook. This booklet provides anticipated service intervals and procedures for both the owner and technician, these service intervals are required to be carried out for the safe operation for your vehicle. These intervals and procedures help maintain trouble free motoring for you and your family. 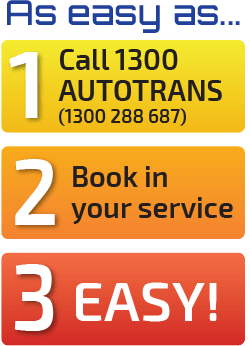 Call 1300AUTOTRANS 1300288687 or request a quote via our contact form. All logbook services carry a 12month / 20,000km Warranty and are carried out by qualified technicians.